“… ultimately, if we are going to reduce the numbers coming here we need action that gives greater control of migration from the EU. As I have said previously, we can do this by reducing the draw that our welfare system can exert across Europe. To those who say that this won’t make a difference. I say look at the figures. We now know that, at any one time, around 40 per cent of all recent European Economic Area migrants are supported by the UK benefits system with each family claiming on average around £6,000 a year of in work benefits alone and over 10,000 recently-arrived families claiming over £10,000 a year. The basis for these figures was quite unclear, and remains so even after sight of the DWP Statistical Analysis from which it derives. This 8 page document comprises a lengthy preamble describing in general terms the data sources used and methodological points and then a simple statement that the results were that in March 2013 between 195,000 and 235,000 EEA nationals in total were benefiting from claims to welfare out of a total population of recent arrivals of 525,000, meaning that between 37% and 43% of them were supported by the benefits system. The only other detail is the statement that 66% of claims were from households with someone in work, and 34% from households with no one in work. There is not any actual data in this published analysis, nor any information about rates of claim to particular benefits nor rates of claim by people from particular countries. Further, and significantly, there is nothing about the cost of these claims. As the Prime Minister make clear reference to costs, this suggests that what has been published is not in fact the full analysis. This obviously begs the question of why the full analysis has not been published. There is little assurance that these figures are likely to be representative of today. 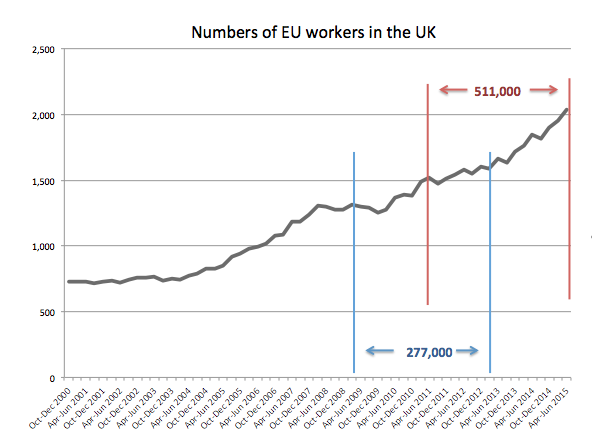 March 2013 is two and a half years ago and in the four years leading up to that date the number of EU migrants working in the UK grew by 277,000. In the four years leading up to Apr-Jun 2015 (the most recent period for which data is available) their number grew by 511,000. So the people here now are to a large extent a quite different group of people. Further if claim rates were indeed as high as 43% in March 2013 for those who had arrived in the previous four years it is quite possible that this was heavily influenced by ‘post-recessionary’ factors which will have now worked their way out of the system. The large recent increases in the numbers of EU migrants in employment, and indeed the return to real wage growth in the whole economy would certainly suggest that. In this context, it’s worth noting that the DWP statistical analysis concluded that 34% of claims in March 20103 were out-of-work claims. This would have been near enough 15% of the recent EEA population at the time (34% of the 43% population claiming). While this seems rather high it is not entirely inconsistent with the employment rate for all EU migrants at the time of 75.4% (bearing in mind that many people not working are with a partner who is working). The employment rate for all EU migrants now is 79.5%, a considerable difference which would suggest a rather lower rate of out-of-work claim now than in 2013. The actual figure of 43% that appeared in headlines is said to be the proportion of EEA migrants who in March 2013 were claiming any kind of benefit (except child benefit). As above, the DWP statistical analysis sheds very little light on this, although they actually give a range for claimant numbers which will give a result of between 37% and 43%. 43% is thus the maximum of the estimate and presumably why the Prime Minister said ‘around 40%’. However, there is a key point that casts doubt on how meaningful these figures are. Instead, the DWP statistical analysis has counted all the individuals (including children) who are comprised in claims and compared these with the total number of individuals. To give a very simple example, if there were two neighbours, one a single lady working away hard without claiming any benefits and one a single mother with three children claiming tax credits, most people on the other side of the road to them would say ‘half of the people over there are claiming benefits’, because one neighbour is claiming and the other is not. However the DWP say in their analysis that the single mother and each of her three children are claiming, meaning that on this side of the road four people are claiming and only one not claiming, meaning that 80% of the people are claiming. If only the adults in the DWP statistical analysis are used, the range drops from 37%-43% to the rather lower 25%-36%. It’s also clear that the numbers of migrants used as ‘claimants’ include people with UK partners. It seems vanishingly unlikely that there could be any restriction on claims by UK-born people with a migrant partner. Fairness aside, this could lead to quite perverse results. Imagine a British single mum with three children who even working could be getting well over £10,000 a year in benefits. If she meets a nice guy recently arrived from Portugal who’s working too and they couple up, that will considerably reduce the welfare bill as his income is taken into account in means-testing the household. But if she’s told she will lose all her benefits then she’s better off carrying on alone (perhaps just seeing him once in a while). Fiscally and personally, that isn’t an optimal outcome. Now unless it is proposed to take benefits altogether from people coupling up with recent arrivals, then it is not appropriate to include these recent arrivals in any estimation of people likely to be affected. Taking these out of the numerator (while obviously they remain in the denominator) would reduce the range further, likely bringing at least the lower end of the range below 20%, by which time it is less than half of the original headline figure of 43%. The question remains for government, that whatever the ballpark figure, whether it is around 40% or around half of that, they have given no indication of the impact that they believe any policy of benefit restriction might have on migrant flows.